Bread Pudding, how to improve on a classic? And, why would it need any changes, really? Ah, but it is possible to make even a humble dessert meant to revive stale bread more posh. Rum raisin ice cream is one of my most favorite foods and, in fact, I have been known to dream about polishing off a pint of the stuff. I love it so much, that I found a way to make it a legitimate dish for breakfast. Rum raisin bread pudding fresh out of the oven is a cozy delight to have for breakfast on any morning, but especially chilly ones. Crusty bread is buttered on both sides and allowed time to soak up a rich custard flavored with warm spices, then crowned with rum-soaked raisins before baking. If you’re not a fan of raisins, dried tart cherries plump up beautifully, too and have a similar chewy bite. Never, ever throw that petrified loaf of bread away. Not only does it function perfectly as a self-defense projectile, it is the foundation of a successful bread pudding, thirsty enough to soak up the custard nicely. Plan ahead so that the bread has enough time to rest in that delicious vanilla-scented bath overnight. But, since I was short on time (I couldn’t wait), I tossed everything together and popped it into the oven. Soon the whole house filled with the aroma of cinnamon butter and everyone was buzzing around the kitchen, waiting for that gorgeous treat to come out of the oven. Every bite of this sweet bread pudding drenched is luscious caramel sauce is like a warm and cozy hug for your tummy. Toss raisins into a little bowl and drizzle with rum. Set aside to plump up, at least 30 mins. Butter a rectangular baking dish and set aside. Butter each slice of bread on both sides and arrange in the baking dish, overlapping and snug. Whisk eggs, cream, cinnamon, nutmeg and vanilla. 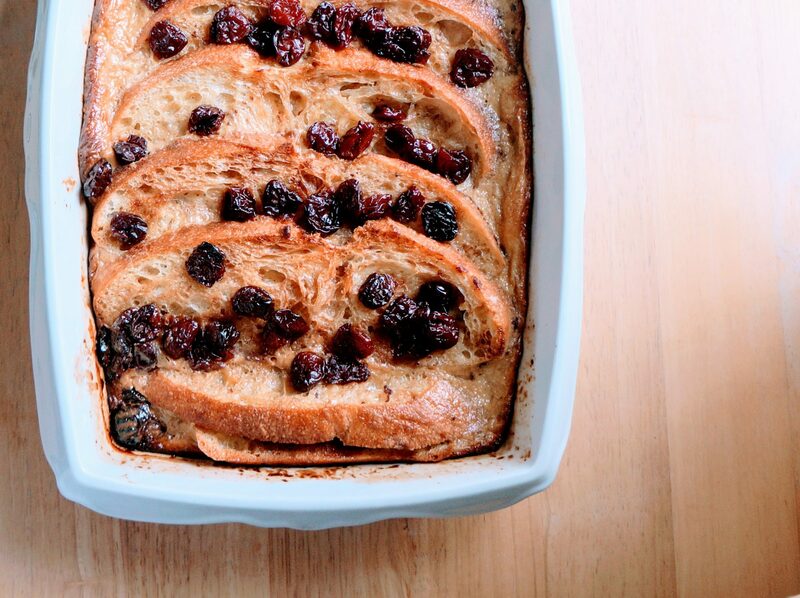 Pour the custard over the bread and sprinkle the rum-soaked raisins. Cover with foil and pop into the fridge at least for 30 mins or overnight. Preheat the oven to 375*F.
Place the baking dish into a deep roasting pan. Add enough hot water to come halfway up the sides of the dish. Bake 45 minutes until golden brown. Carefully remove from the oven. Lift the baking dish out of the water bath and set onto a metal rack to cool a bit. Expect a layer of molten butter on top. The pudding will soak the butter up as it cools. Whisk in the sugar and cream. Once the sauce begins to boil, reduce the heat and simmer, uncovered for 10 mins, stirring frequently. Spoon sauce over the warm pudding, sprinkle coarse salt evenly and serve with berries and freshly brewed hot coffee. Bread pudding is one of the easiest things to make and the best way to recycle stale bread. Everything can be done the night before so that all you have to do in the morning is pop the lot into the hot oven and voila, breakfast is served! Consider it a baked French toast. Don’t bother getting dressed. Appropriate attire for the breakfast table includes pajamas, a cozy robe and fuzzy slippers, because you will want to eat this one while it’s hot! Leftovers are lovely for dessert after dinner, assuming you haven’t polished off the whole lot earlier. A.) I am so glad to be back on your mailing list! B.) This bread putting looks fantastic! C.) I love that you’re feeding four starving sailors!